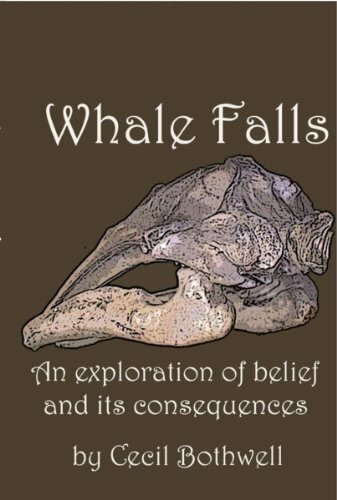 THE BOOK: Whale Falls: An Exploration of Belief and its Consequences. THE PUBLISHER: Brave Ulysses Books (the author’s own imprint). SUMMARY: Beginning with Neanderthal confrontations with a beached whale, this book carries the reader across centuries and continents to listen to the ocean-spanning songs of modern cetaceans. Theory of mind, indigenous rights, LSD, Viking settlements, mummies, cancer, homesteading, chaos theorty and terrorism all appear and recedce beneath the wheels, beyond the wake, of a vehicle carrying us forward to uncharted waters. THE BACK STORY: The idea for this book started when I learned of whale falls — the carcasses of ceteceans that sink to the deepest depths of the ocean, where wholly different life forms have evolved. The food chain is based on methane instead of oxygen (scarce at such depths). Then I read that some scientists theorized we could inject such organisms into the upper atmosphere to consume methane, the most potent of greenhouse gasses, and the symmetry struck me immediately. Whale oil began our addiction to combustible liquid fuels (and whales were only saved from extinction by dint of an oil gusher in Pennsylvania), and now the fruit of their carcasses might save us from extinction due to warming. That seemed a metaphor for so many situations in which a problem and a solution are linked in unexpected ways. Midway through the year-long writing I was elected to City Council, outed as an atheist and suddenly acquired my 15 minutes of international fame (long story). But I realized that this book had to be about a much bigger picture of ethics and choices about how we examine and live our lives. WHY THIS TITLE? Those of us who have seen whales in the wild world are generally most impressed by breaching, when a massive mammal rises from the water. I don’t think many people consider what happens when a whale finally falls. WHY WOULD SOMEONE WANT TO READ IT? I learned a lot about myself in writing this book. It is the most personal, and partly memoir. I have been told by many readers that it worked in their own minds in a similar way, casting light on decisions for better and sometimes worse in their lives. AUTHOR PROFILE: My career includes decades as a green builder, founding editor of a Warren Wilson College environmental journal, managing editor, investigative reporter, radio host and commentator, syndicated columnist, musician, slam poet, artist and organic gardener. I’ve authored 10 books, won regional and national journalism awards, and have addressed issues of ethics and the environment before groups in 25 cities in a dozen states. A Buncombe resident for 37 years I have camped and traveled in every state and canoed parts of every major river system in North America. For more than a decade I have served on the boards of two local nonprofit groups building libraries and grade schools in Bolivia and Guatemala. We are wanderers, you and I. We’re on a too-short sojourn from wasn’t to isn’t, on a trajectory we were thrown into, on a pathway we invent. Our footsteps are tiny and even the most dedicated walkers among us do not travel far between birth and death. We tend to focus on the local landscape, on the immediate event, and to whatever extent we see beyond depends in large part on the stories of others. A few have gone up the mountain to peer into the next valley, a few have crossed the ocean and returned, and now a very few have looked back from space. It is only in this last flickering moment that we wanderers have set ourselves to meddling with the biology and chemistry and nuclear forces that have balanced their own books to create our living planet. It is only in the last quarter of a moment that there have been enough of us for our meddling to have much effect. And it is only in the last blink of our eye that we have begun to understand that our numbers and our meddling can effect systemic change in the fragile bubble of life that is our world. We have built our empires on petroleum, the stored energy of a hundred billion sunrises, and are using up that energy in less than one hundred thousand days. LOCAL OUTLETS: Malaprops Cafe and Books, Asheville, NC. WHERE ELSE TO BUY IT: Braveulysses.com, Amazon, Barnes & Noble. CONTACT THE AUTHOR: cecil@braveulysses, @cecilbothwell, cecilbothwell.com. And wow. I can’t believe I made that many typos! Guess I was in a hurry.